MILLS Continued Quadro Engineering Corp. Stedman Machine Co. SWECO Telsonic Ultrasonics, Inc. Union Process, Inc. MIXERS & BLENDERS Baffled Bepex International, LLC Charles Ross & Son Co. Continental Products Corp. G2 Material Handling, Inc. Lee Industries, Inc. / Fluid Transfer M.O. Industries, Inc. Munson Machinery Co., Inc. NETZSCH Premier Technologies, LLC Reliance Industries, Inc. Zeppelin Systems USA, Inc. Bin Custom Powder Systems, LLC G2 Material Handling, Inc. Industrial Accessories Co. Jenike & Johanson, Inc. Material Flow Solutions, Inc. Modwave, LLC National Bulk Equipment O.A. Newton PVS Process Equipment Sterling Systems & Controls, Inc. Yargus Manufacturing, Inc. Zeppelin Systems USA, Inc. Bottom entry agitated Andritz Separation, Inc. Bepex International, LLC The Eagle Group, Ltd. G2 Material Handling, Inc. Lee Industries, Inc. / Fluid Transfer National Bulk Equipment NETZSCH Premier Technologies, LLC Quadro Engineering Corp. Reliance Industries, Inc. Zeppelin Systems USA, Inc. Chilled Applicon Co., Inc. Bepex International, LLC Charles Ross & Son Co. Cyclonaire Corp. General Kinematics Corp. Hayes & Stolz Ind. Mfg., Co. Jaygo, Inc. KWS Manufacturing Company, Ltd. List USA, Inc. Luxme International, Ltd. Marion Process Solutions Modwave, LLC Munson Machinery Co., Inc. O.A. 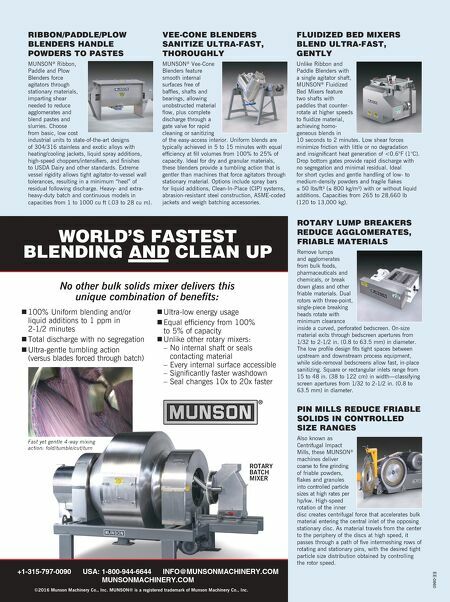 Newton Readco Kurimoto, LLC 134 August 2018 PBE powderbulk.com Log on to subscribe. 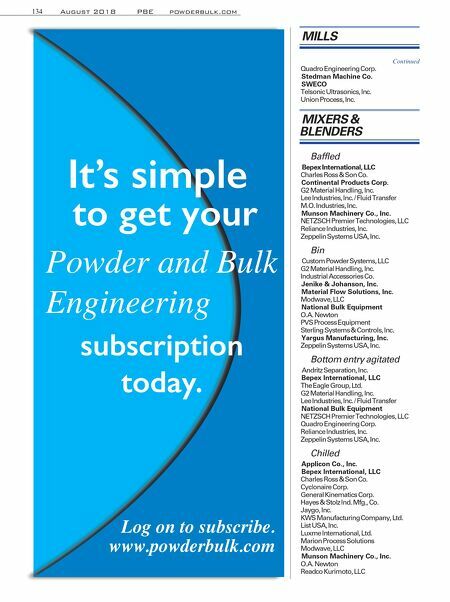 www.powderbulk.com It's simple to get your Powder and Bulk Engineering subscription today.